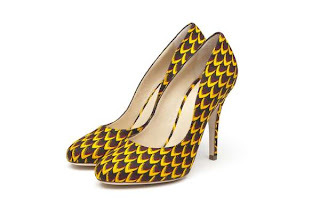 African-inspired prints have been quite popular in women's footwear the last few seasons. Spring 2013 is no different with designers like Liam Fahy creating a collection using the patterns on classic styles. 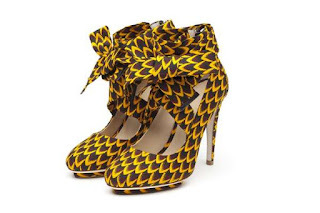 The luxury footwear label says this season's collection is actually inspired by Katherine Hepburn's The African Queen; safari-inspired with a European feel. The colours are rich with mustard, reds and other hues of nature. Liam Fahy is from Zimbabwe and has been creating luxury hand made limited edition footwear.